NEW HAVEN—On paper, all it took was 6.614 seconds for Christ N’Dabian to defend his South West Conference championship in the 55-meter dash. In the real world, however, it took a year of hard work for the Bunnell High School senior sprinter to remain the fastest kid in the league. N’Dabian led a charge of three Bulldogs in the top four spots in the event, highlighting Saturday night’s meet at the Floyd Little Athletic Center at Hillhouse High School. Behind its surge of sprinters and jumpers, the Bunnell boys placed sixth in the 12-team field with 30 points. The Bulldogs girls were seventh with 28 points. Stratford scored 14 points in the girl meet and just one in the boys meet. Weston swept the league championships with 110 points in the boy’s meet and 117 in the girls. The Bulldogs amassed two-thirds of their points in the 55 as Alex Mosley placed third (6.73) and Marquise Lawrence took fourth (6.77). All three were part of Bunnell’s 4×200 relay team—which was disqualified for a zone violation after being seeded fifth in the event. Later in the evening, N’Dabian also placed fifth in the 300—an event he hasn’t run since his freshman year. N’Dabian ran a 37.55 (his seed time was 39.54) to take home another medal and add two more points to Bunnell’s total. The race of the day might have come from Stratford’s Elle Moshier in the girls’ half of the event. Running in the next-to-last heat, Moshier, who was seeded sixth, blistered the field in her race and placed second overall with a time of 43.55. Her seed time was 44.47. Forget said his standout sprinter—who had a rough 55 race and finished ninth—ran her best race of the season. Moshier, a sophomore, also anchored the Red Devils’ 4×200 team to a fourth-place finish in 1:52.67. She was joined by Chi Chi Anekwe, Kelly Goddard, and Ava Buckmir. Finishing one spot better than Stratford in that event was Bunnell, which ran a 1:52.35. Kaylah Phommachanh, Kesiri Gonzalez, Dardielle Exantus and Abby Williams made up the team. 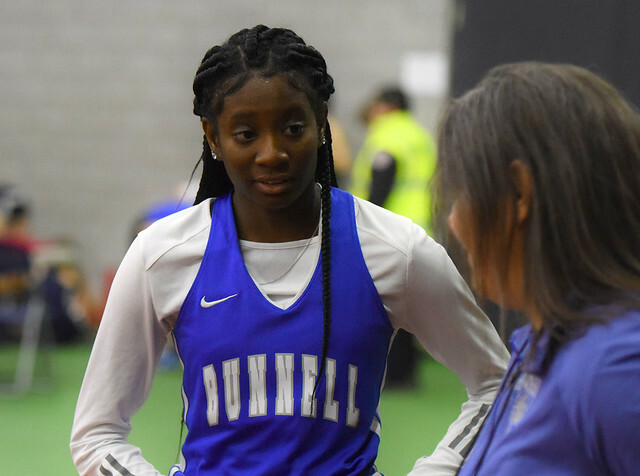 Williams had the best day for the Bunnell girls, finishing second in the long jump and fourth in the 55 hurdles—a showing that her split emotionally. Williams was the top seed by almost a foot after her school-record leap of 17-6 earlier this indoor season. It was only after she popped a 16-3 ½ on her final jump, however, that was she earned second place. Other Bulldogs who earned points for their team were Jesone Khantikone, who was second in the long jump (19-11) and Phommachanh, who placed fifth in the 55 (7.74). For Stratford, Anekwe was fifth in the girls long jump and the boys 4×800 relay team (Julian Pilla, Dominic Gomes, Elijah Brown, Elijah Henry) took sixth in 9:21.80.